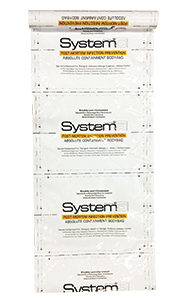 BioSeal System5® is a heavy duty, fully hermetic Bio-Safety Level 4 (BSL-4) Containment body bag. 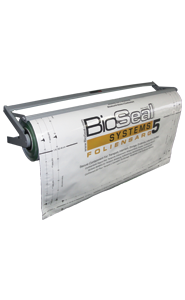 It is comprised of a proprietary co-laminated flexible metal material that is heat-sealed with the BioSeal Hand-Held Thermosealer to create the original absolute containment solution for infectious human remains or animal specimens. This technology has been military tested and proven in keeping health care workers safe for over 15 years. Made of a military tested and proven flexible metal material that meets Biosafety Level 4 (BSL-4) containment standards and is the original fully hermetic body bag for infectious human remains. System5® meets IATA requirements for air transport and repatriation and is safe for cremation. It has a 49-year shelf life and is ideal for long-term storage with only 8" x 8" required space per roll. Single use 8' pouch also available. 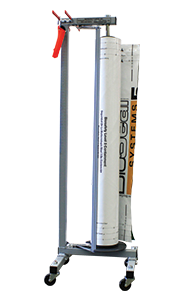 Required for use with the System5® containment material, this tool creates a fully hermetic seal when used as directed. 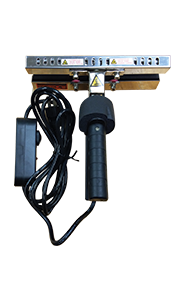 Plug in the heat sealer and set to the highest heat setting (Level 8). When sealing, press each section for up to 3 seconds to ensure a tight seal. Check for the presence of channels in your seal to ensure the bag is sealed hermetically. Designed to hold the System5® roll of material. When it comes time to seal a decedent, easily roll the wheeled Vertical Rack to the desired location, then roll it back when you are done. This vertical dispenser allows you to unroll the System5® material directly onto the gurney or table. Dimensions: 16" x 16" x 45"
Included in the Facility System, or available for purchase as an individual item. Designed to hold the System5® roll of material. Keep your prep room floor clear by mounting the wall-mount rack in the desired location away from the floor. Easily unroll and cut the necessary length of System5® material while avoiding excess floor clutter. Included in the Wall-Mount System, or available for purchase as an individual item.